The countdown stops and there is a moment of silence. We’re all holding our breaths, even table 14 girl. There is a sudden burst of cold air from the vents above and table 5 boy gasps. The cold air drifts down and little bumps spread over my skin. I clench my teeth so they can’t shiver against each other. My breath freezes in the air above my nose. I close my eyes. “Phase one commencing. Please begin with your toes,” the metallic voice commands. It tickles, pushing my soul out of my cells. My feet are especially sensitive. Laughing now would be disastrous so I bite my cheek until a coppery tang reaches my tongue. The tickle eases with the pain. My toes feel lighter, stronger, no longer burdened by the weight of my soul. I keep pushing. Inch by inch, I make sure to remove every spec of soul. I don’t want to fail the scan. Up my ankles, calves, thighs, my soul moves before pooling around my intestines. The real pain starts as small prickles around my knees and increasing to bruising aches in my thighs. My chest is rising and falling heavily and beads of sweat are rolling off my forehead. I take a moment to catch my breath. My legs tremble with lightness causing a slight hum from my table. Other tables are humming too. I find my table. Number 4. Front row. I can’t believe testing day is finally here. I’ve been fighting a nervous smile all morning. I hop onto the cold metal surface making a metallic pop as the table adjusts to my weight. The girl at table 14 clicks her tongue at me scornfully. She climbs onto her table without a sound. I watch as she adjusts her white robe, making sure her knee caps never show. I swing my own legs up and stretch out my toes. My knee caps are showing. When table 14 girl turns to look over her shoulder disparagingly at table 22 boy when his sweat covered hands cause him to slip with a terrific metallic rumble, I quickly pull down my own white robe. I press my fingers to my lips to stop the smile-twitch. I have to do better than table 14 girl. Table 5 boy is facing me with crisp blue eyes. He’s clasping his hands to try and stop the trembling. Today is a big day. We’ve practiced hundreds of times but it’s one thing to pretend and another to actually do it. And we have to pass. Table 78 girl shares a dorm with me. She told me that if we don’t pass, we don’t get a career. I can feel a bubble of panicky giggles building behind my belly-button. I lie down and press a fist hard into my stomach. I can’t laugh now. Not getting a career is just about the worst thing ever. My parents work at BioChem II. I met them 3 months ago. After testing, I can go and live with them instead of table 78 girl. The temperature is being lowered and I can feel my table all down my back and legs. Table 78 girl says that BioChem II is really important and reports directly to the PM. She says I giggle too much to get a career at BioChem II. I punch my traitorous stomach once more before spreading my fingers flat-palmed on the table. The cold helps. It’s so quiet I can make out the erratic breathing of table 5 boy. He needs to calm down. I close my eyes and focus on the voice. I first heard about The Ward while the book was still being edited. Its author, Jordana Frankel, gave a talk at her alma mater about plotting a YA novel. She read from the first chapter and laid out a timeline. I knew I wanted to get my hands on the finished book. 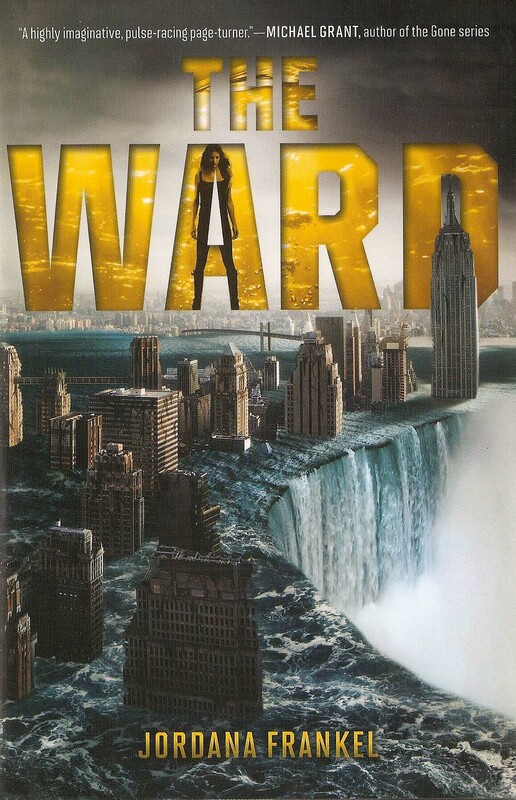 The Ward is a dystopian novel, set in a waterlogged future New York City plagued by an infectious, cancer-like disease called the Blight. Its protagonist, Ren, is a 16-year-old who’s grown up fast. Orphaned like many children in the Ward, she has relied on resourcefulness and quick-thinking to stay alive and care for her younger sister, Aven, who is dying slowly from the Blight. Ren races a mobile and works secretly for the government in order to pay for medicine. While searching for fresh water, she makes a surprising discovery with effects that could change the future for everyone in the Ward. This book is fast-paced, and the setting is full of perils. It also offers a backdrop for exciting underwater chase scenes, or claustrophobic explorations of the city beneath the water. I didn’t always love Ren, but I appreciated her intense affection for Aven and the way she spoke her mind, including the way her open sexual interest in certain male characters was narrated. There is a lot packed into this 465-page book, apparently the first in a two-part series. It delivers action, romance, and suspense (there’s even some gore, and a few scenes that feel right out of a horror story). At times, the events of the novel were moving so quickly (or the actions in a scene), that I had difficulty picturing them as I read. I was a little disappointed that with such an evocative setting, Frankel didn’t play around more, either with the mobile racing or the creepy, abandoned sectors of the Ward. Occasionally, I felt that unimportant events got too much stage time while other scenes could have lasted longer. Nevertheless, I think Frankel’s unique setting and premise set this YA novel apart from other dystopian futures. And Ren takes control of her fate while piloting a mobile at breakneck speed, being intimidated by police and government figures, and navigating the plague-ridden wings of the hospital and the Ward. Although there are moments where her emotional immaturity shines through (she is, after all, a teenaged girl), she makes some pretty tough decisions and makes them with aplomb. Jordana Frankel will read from her work on March 11 in Towson, MD. The event is free and open to the public. For details, go here. It was the boy with dark hair. Helena stopped and dropped to the ground. Her hand slid into something slimy and she had to bite her tongue to keep from screaming. She could hear his feet kicking cans out of the way as he headed toward the rusted blue truck. She held her breath as he passed close, but he didn’t notice her; she was just another piece of trash, all dirty and discarded. Helena stayed where she was until she heard the squeaky hinges of the truck door before jumping up and bolting to the far side of the Heap. She skidded to a halt in front of her box and looked over her shoulder, but there was no movement behind her. She ducked behind the faded denim flap that served as her door and squatted in the semi-darkness. Helena examined the key. It was metal, warm from being held in her sweaty palm as she ran. There didn’t seem to be anything special about it. She felt around the floor of the box until she found some fishing line and pulled it through a hole on the key. She tied the line around her neck and let the key fall under her shirt. Derrick had probably seen her at the truck. If she lost her prize now, he would kill her for sure. Peter slammed the truck door shut and listened to the tinkle of rusted pieces falling off. It sounded almost like rain, or what he remembered rain sounding like. He leaned back over the worn leather of the front seat to glance in the back of the cab. He added a half full bottle of water to the pile. It was all he had found today. His rat stopped digging in its newspaper bedding to watch the bottle teeter for a moment before falling to the floor and rolling under the front seat. Peter sighed and slipped to the floor to retrieve the bottle. His hair fell into his eyes and he had to push it back a couple of times before he spotted the bottle. He reached for it and was just able to get it rolling toward the front of the cab with the tips of his fingers. He grasped the bottle in one hand and ran his other hand under the seat searching for the key. eighteen eighty-eight at eight o’clock. Minutes after they’d left Eton’s grounds, Samuel, in charge of everything since they were thirteen, made Paul change from his King’s Scholar robes into a costume he’d nicked from the playhouse cupboards. “Wouldn’t want to look like a couple of toffs, would we?” The wool itched against the skin at Paul’s throat and wrists. And deep inside he knew he wasn’t a toff to begin with, not even close. He’d needled Samuel for almost the entire carriage ride from Eton to London. Seven hours of begging and pleading, as Samuel laughed and changed the subject. Paul stands in London, in front of number 16 on his sixteenth birthday, and he remains still and silent. He presses his lips tightly together. Carts and horses jostle each other in the overcrowded streets behind him, children and cats race down alleyways, and smoke rises up from chimneys. Paul likens his reaction to an over stimulated cat, not knowing where to look next. The stillness is broken as he fiddles with the baker boy’s brim. Pulls it down on his brow, pushes it up. Down. Up. Down. Samuel swats his nervous hand from touching the scratchy fabric again. In my eighteen years of life, I’ve learned that most of it is about getting in. Everybody wants to be on the inside. In high school it’s about popularity, and who gets to hold hands and other things with the cutest jock or doe eyed knock-off ten-seconds-to-knocked-up-barbie. I got out of there without getting a disease or a child. College is all about getting in. Whether it’s Ivy League or someone’s pants. I shot for the former and landed in a respectable school that wasn’t necessarily Ivy League, but there were a lot of ivy covered buildings, so I figured that had to count for something. I was there to find something elusive and highly regarded. Something you didn’t find in anyone’s pants. They called it a future. And somehow they told me I’d find it in rooms full of kids making decisions bigger than eighteen years on Earth. Heavy decisions, ones that sounded like things grown ups would do. They told us we were grown ups. They lied. I was not grown the nights I spilled my guts to a girl with eyes that changed color like dusk and realized I was never going to be one for jocks or barbies. She was trimmed in ink lines and her voice was like waves on waves on waves, full of lulling clarity. She hummed notes of songs I knew when I was little, and they sounded like promises falling from her perfect smile. I’d never wanted harmonies, but I wanted them with her. Her lips tasted like sugar and rain and we twined together for five weeks before her eyes turned dark. “Yes?” My lips were at her ear, and she shivered in the dark. “I want the future,” I told her. She raised the key to her lips and pressed it to them. It glowed for a moment, all embers. She curled my fingers around it and she was gone in an instant, fast as a summer storm. My skin burned where her eyes had held it, but I still held that key hot and heavy in my hand. It works on every single lock. Stay tuned for extra content this week from Julie. Check out Anne’s answer to this prompt next Monday.